Some days feel like time-outs. If life is like a giant game of tag, and “it” is pursuing you relentlessly, and you’re giggling, breathless, with that small edge of real fear that tag-playing elicits, and you’re miles from base: sometimes you have to call time-out. The last couple of days have felt like that. Isaac and I have been on a team, and we’re taking a little time out together. He’s under the weather. Monday we spent a couple of useless hours at the doctors’ office, and I got antsy, and thought, “Dammit, I’ve got important things I need to be doing!” Yesterday he had a fever, and the whole house was hot as hell except for his air-conditioned room. He didn’t want to be alone, so I lay on his bed next to him, and thought, “Oh dear, I’ve got important things I need to be doing!” And then I realized that I really don’t. It’s an interesting fact about a time-out, that sometimes from this point of view you see the game more clearly – everybody else running around frantically, in a red-faced tizzy. As I lay there besides Isaac, with his hot little head touching mine, I realized that I don’t really have anything important to do. The realization was a little sobering, a little liberating. I was very tired, because I don’t sleep much when there’s a fever in the house, and for the moment it felt good to lie next to Isaac, and listen to him explain Isaac-y things to me in his sweet serious way. Their room is bright, with sea-green trim and pale curtains that hold the light. It felt a little like floating in cool water for a short while. And, of course, this little glowing ripple of a moment is the most important thing I need to be doing. I’m always a little crazy when the boys aren’t feeling well. I don’t sleep much, I get that weird tired-nervous energy. It makes me want to bake! In the winter time I’ll bake cookies with the boys. It was, frankly, a little hot for baking yesterday, even for me! But I’d had this thought in my head for a while of a tart that would be fun to make and fun to eat. I’m very excited about this one! I think it turned out really well. Really perfect combination of tastes and textures. I’ll tell you all about it. It’s a peppery hazelnut crust, and it’s a very tall crispy crust. 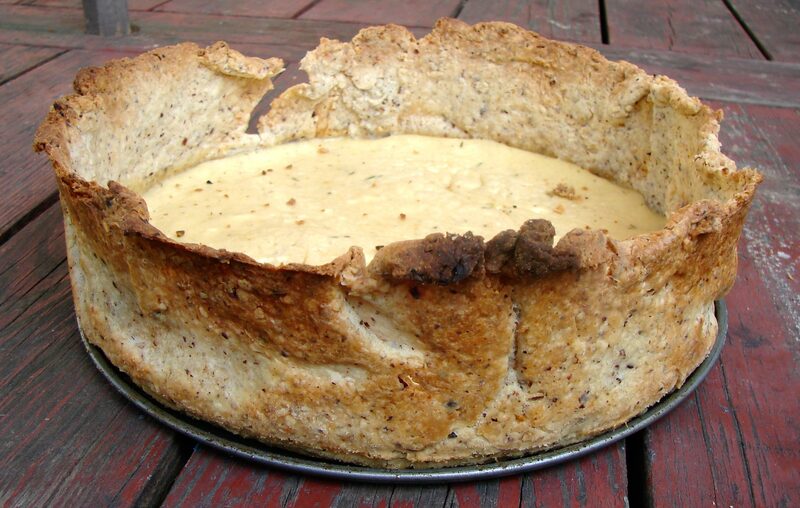 Inside of that, we have a thin layer of goat cheese custard with thyme and caramelized onions. Simple. The whole thing is served slightly warm and inside is a mess of cool, lightly dressed baby arugula with pine nuts and fresh tomatoes! It’s like a salad tart! Perfect for a hot day, cause you can make the whole thing in advance. I love goat cheese with arugula. I love hazelnuts with arugula. (If you don’t have pine nuts, you can use toasted chopped hazelnuts instead.) This is a nice thing to eat when you’re taking a time out. Be it a summer-day time out, or a stop-and-enjoy-your-nice-dinner-and-glass-of-wine time out. Here’s Dave Brubeck’s Take Five. Combine the hazelnuts, flour, salt and pepper. Make a well in the center and grate in the frozen butter. Mix with a fork till you have coarse crumbs. Add enough ice water to pull together into a workable ball. (Should be less than 1/2 cup) Knead lightly for about a minute, to make sure the butter is well incorporated, and then wrap in foil and chill for at least an hour. Whisk the eggs and milk in a bowl. Add the thyme and nutmeg and salt. Whisk in the goat cheese till fairly smooth. (A dew lumps are fine.) Stir in the caramelized onions. Butter and flour a springform pan. Roll the dough on a well-floured surface, with a well-floured rolling pin to be about 1/4 inch thick and about the size of your springform pan. Don’t worry about making the edges perfectly neat. Fold the dough carefully in quarters, and move over to the springform pan, unfolding it carefully and draping it over the sides. Try to even it out and center it, pressing into the bottom of the edges of the pan. If you get a hole, smooth one of the folds over it, or tear a piece off the edge. Fold the top over the edge by a tiny bit so it will stay up when it cooks. (You’ll end up breaking most of this off when you open the springform pan.) Put the whole thing in the fridge to chill while you preheat the oven. Preheat the oven to 400. When it’s hot, put the crust in for about ten minutes to pre-bake. If it starts to get brown, take it out. Pour in the filling and return to the oven for about 20 minutes, till the center is puffed and cracked and firm when you touch it, and the edges of the crust are a bit brown. Put this in a bowl. Drizzle over a few teaspoons of olive oil, toss lightly. Shake on a pinch of sea salt, toss lightly. Drizzle on a teaspoon of balsamic. Toss lightly. Grind on a ton of pepper, toss lightly. Right before you eat, using salad tongs or two forks, lift the arugula into the tart shell. Sprinkle toasted pine nuts (about 1/4 cup) or chopped toasted hazelnuts over the arugula, and arrange some small slices of tomato prettily on top. 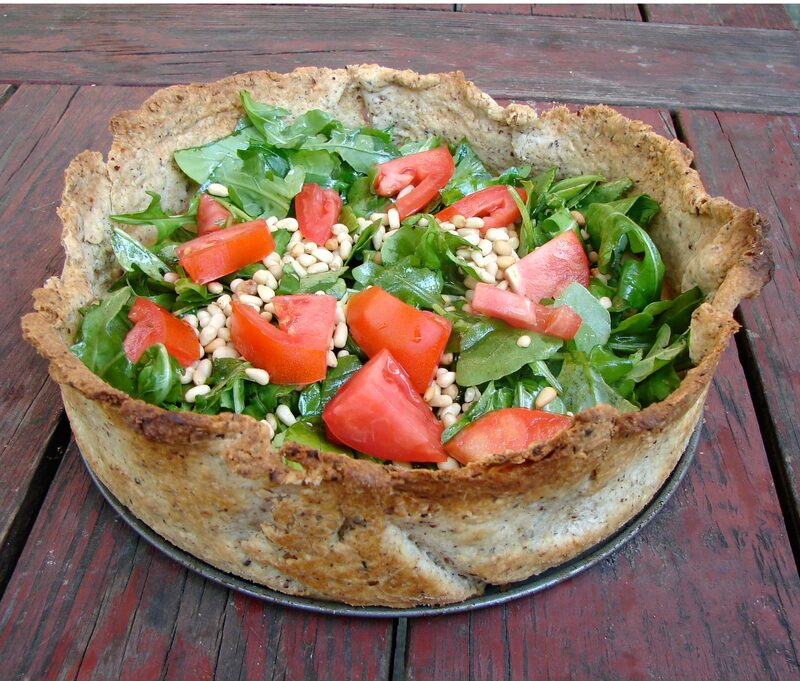 This entry was posted in basic pie filling, crust, pie, Uncategorized and tagged arugula, caramelized onions, goat cheese, hazelnut crust, tall crust tart, thyme, tomatoes by Claire. Bookmark the permalink. Here I sit, with your latest post, drinking a light Rose’ and listening to “Take 5”. Recipe sounds delish! I worked hard all day and this is just what i needed. Thanks, Claire! Hope Isaac’s fever has simmered down. Diane – I can’t think of a more perfect place for a time-out than your garden! I laughed with delight, but with a lump in my throat at the thought of you lying with Isaac’s hot little head against yours as he explained Isaac-y things and you realized that nothing was more important than these precious, golden moments. Hope he is feeling better very soon. Thanks, SR. Turns out he has strep throat, which responds pretty quickly to antibiotics, so he’s feeling better now.